Fiesta San Antonio is nearly here. An economic, cultural, and tourism boon for San Antonio, the festivities will attract nearly 3.5 million partygoers and contribute over $340 million to the local economy. However, as with any large scale celebration, people tend to overdo it and make bad choices that impact the health and safety of others. At the Hill Law Firm, we want everyone to enjoy Fiesta, but make it home safely. 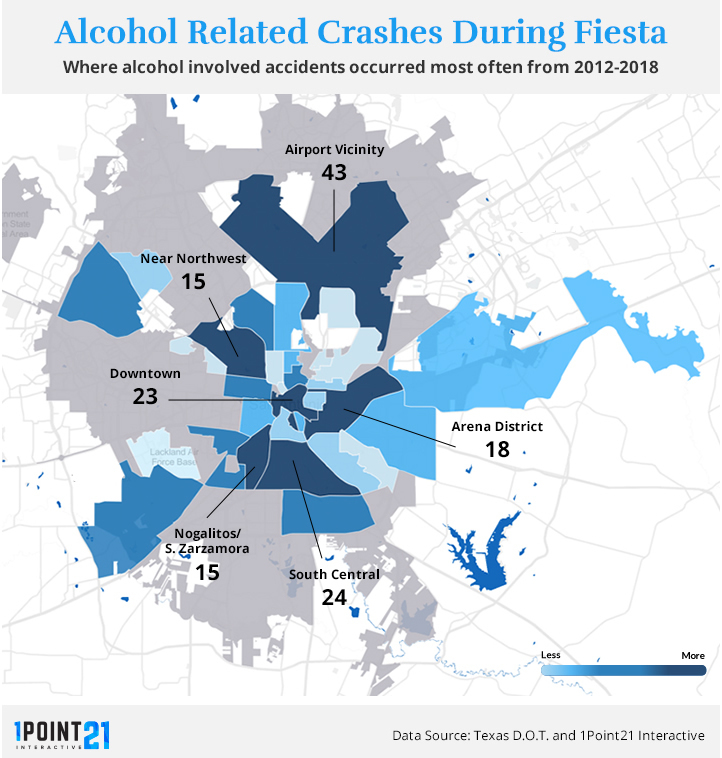 So, with the help of data visualization firm 1Point21 Interactive, we analyzed seven years of Texas Department of Transportation crash data (2012-2018), to identify every alcohol-related motor vehicle crash in Bexar County during each year’s Fiesta. Over this 84 day period, there were 595 crashes where alcohol was a factor, leading to 348 injuries and 13 deaths. We found that during Fiesta San Antonio, there was a nearly 20 percent increase in alcohol-related crashes in Bexar County and a 41 percent increase in resulting injuries. Bexar County averaged 5.88 crashes per day from 2012-2018. During Fiesta San Antonio, the average jumps to 7.08 crashes per day. The map below has every alcohol-involved car crash that has occurred in Bexar County during Fiesta San Antonio from 2012-2018. Larger dots indicate a more serious injury. *Click or hover over map icons to reveal more information about each crash. For best mobile experience, rotate device. It is important to note that these crashes occur in neighborhoods and areas all over San Antonio and Bexar County. While the downtown area had a high concentration of crashes (23), the San Antonio International Airport Vicinity had the most, with 43, followed by South Central with 24. 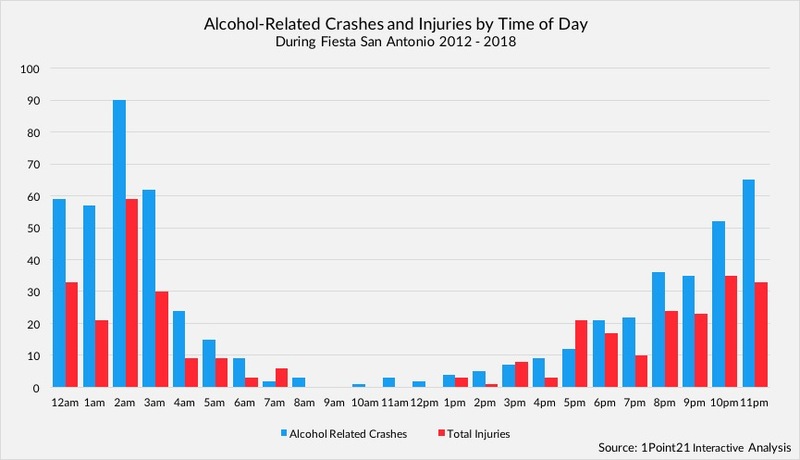 As is typical for alcohol-related crashes in general, crashes and injuries during Fiesta San Antonio peak in the late night, early morning period. Similarly, both crashes and injuries occur much more frequently on weekends. Why Did We Perform this Analysis? As a San Antonio Law Firm, we care deeply about our community and the people in it. We feel that bringing awareness to a problem is the biggest step towards a solution. We want everyone, whether they are a local or a visitor, to enjoy the Fiesta San Antonio celebration – but to do it safely. If you plan to Fiesta, make sure to follow the safety tips below.